"Look for the red lantern," instructs the Macao Trading Co. website. This is how you will know you have reached your destination - the Portuguese colony of Macao circa 1952, "a fugitive's heaven from which there is no turning back." Awesome. We're apparently having dinner at Universal Studios tonight. Last week, we went out on an Immaculate Infatuation blind date. A mutual friend introduced us to two food enthusiasts with whom we share similar tastes and interests, Miss Info and Heather Park. Team Infatuation suggested Macao Trading Co. for dinner based on some recent hype and the promise of an interesting "Chinese meets Portuguese" meal. A Thursday dinner went in the books and we hit the town feeling it. We met our partners in crime at the bar, hit it off immediately, and sat down at our table ready to get into some serious eating. This review wrote itself so fast; I think I have enough material to make it a three part series. First of all, Macao is a huge scene...everyone in the house is either on an early in the game date, or starting off their night before they hit Pink Elephant. Second, the place is essentially a theme restaurant. There must have been a yard sale after the last Indiana Jones movie and the owners of Macao cleaned out every prop that Planet Hollywood didn't already scoop up. I honestly wouldn't have been surprised to see a monkey in a shriner's hat come out and bus the table. The food and service were right about on par with a downtown Ruby Foo's. We ordered a lot from the menu, many of the dishes suggested by our waiter, and nearly everything was overcooked, over seasoned, and overrated. The shining stars from our meal were the chicken dumplings, and you can get five of those for a dollar a few blocks north on Canal Street. Moral of the story? Next time we let our new friends pick the restaurant. This is actually a pretty good dish, and word must have spread quickly since they were out of it by about 9:45pm the night we were there. Small clams in a spicy broth with chorizo sausage, that's a tough combo to hate on. These are lamb meatballs inexplicably filled with a large amount of white cheese. The cheese is unnecessary and unappetizing. I imagine the thought process went something like "hey, it worked for stuffed crust pizza...yep let's do it". This dish somehow lacks flavor. Aside from the texture, the potato in the dish and the octopus taste exactly the same. Our blue ribbon winner for the night, but honestly you can't screw these up and still be open for business, and you shouldn't be charging nine dollars for four of them. I have a hard time believing these ribs come from a pig and not a wooly mammoth. Maybe the biggest pork ribs I've seen, and it took an hour to eat one. Messy and unimpressive. This is a large serving of glass noodles with minced pork. It could have been much better, but the noodles were overcooked and mushy. Almost a really good dish, but the Bacalao (salt cod) wass way too salty, even for the taste buds of Miss Info and Heather Park who have eaten their way through every ethnic food in this city. Swing and a miss. So it’s not often that a wine bar comes with an enthusiastic Infatuation Approval, but Terroir’s new outpost in Tribeca most certainly does. A great neighborhood daytime café in Tribeca with plenty of space to spread out. Edward's is a casual place in Tribeca to grab a burger, some tacos, or a nice piece of fish. 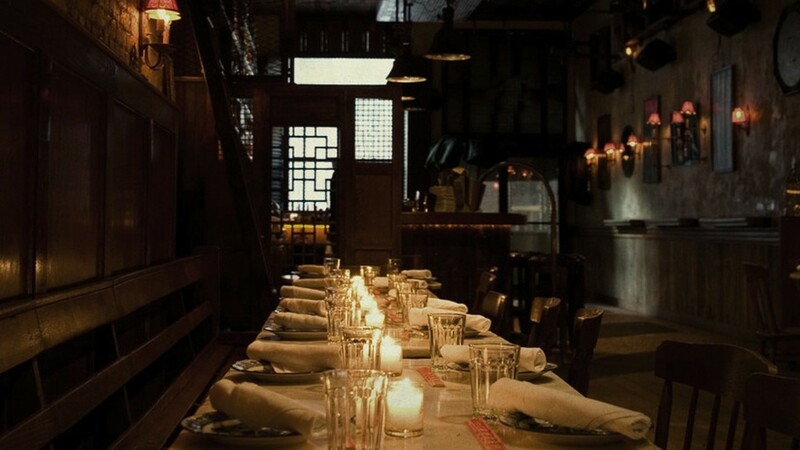 Marc Forgione is a good choice when you need a non-stuffy special occasion spot. Radiance Tea House is a great little place to get some grub, drink a pot of tea, and maybe peruse a text about Buddhism. We find ourselves in here from time to time to do exactly that – except for the Buddhism part.